In Ukraine, 35.3% of cancer patients die within a year of their diagnosis. This figure is 26% for the US, 23% for France, and 25% for Germany. Such a significant difference is due to only one aspect of treatment: diagnostics. It so happens that Ukrainians tend to seek medical assistance when their cancer has progressed to the final stage. Moreover, cancer diagnostic equipment in Ukraine often fails to produce accurate results. But let’s take it one step at a time. According to data provided by regional health care departments, medical facilities in Ukraine annually receive a mere 5% of the necessary equipment. Before 1992, 300 manufacturers supplied tomographic scanners and X-ray units to Ukraine. Notably, 65% of them were based in what is now Russia, while Ukrainian manufacturers could supply no more than 20% of the nation’s demand for medical equipment. As a result, health care officials are now facing an unpleasant reality. Between 50% and 60% of the equipment in outpatient and inpatient facilities is obsolete. Most of it has been in use for 20-25 years, two to three times longer than its service life. The worst situation may be found in radiological diagnostics, where only 20% of the equipment has not outlived its service life of ten years. Despite all this, the Health Ministry has said that within the next five years Ukrainian medical facilities will be outfitted with modern equipment. Cause for such optimism is the experience of the past two years, when the ministry purchased over 4,500 units of medical equipment, such as X-ray units, endoscopes, anesthetic and respiratory units, as well as laboratory and ophthalmological equipment. 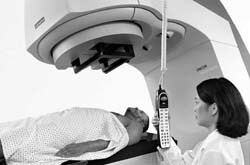 In addition, Ukraine also purchased equipment never before seen in this country, such as mobile mammography and X-ray laboratories, spiral computerized tomographic scanners, and angiographs. Without going into technical details, one can say that those lucky enough to operate such equipment at last have the opportunity to administer treatment according to guidelines approved by international organizations. This has become possible through adequate funding. For example, of the UAH 123.2 million earmarked for new equipment in 2002, the Health Ministry received a mere UAH 24.4 million, or 19.7% of the expected amount. But in late 2003 the Health Ministry received all of the UAH 115.5 million in promised funding. However, with memories of underfunding still fresh, the ministry somewhat modified its policy of equipment purchases in 2003. Taking into account the proposals from regional health care departments and the fact that prices in the medical equipment market have remained stable, the ministry decided to extend its old contracts. But this is not the most important thing. In 2003 and 2004 the ministry launched the centralized purchasing of equipment, which has enabled it to save 10% to 15% on equipment by Ukrainian manufacturers and up to 25% on foreign-made equipment. It’s another question altogether that centralized purchasing has caused quite a commotion in the Ukrainian medical equipment market, as complaints have flooded in from bidders displeased with tender results. According to Ukrmed director Mykola Kuzma, complaints from losing bidders are absolutely unfounded. For example, certain bidders could not even correctly prepare bids for the tender. Quite naturally, this caused tender committee members to question the quality of their equipment and even more so their reliability. After all, the winning bidder must provide a warranty for his equipment along with warranty repairs and maintenance services. As a case in point, Siemens Ukraine has won half of the tenders for which it entered bids because its equipment comes with a whole range of warranties and the obligation to teach doctors how to operate the equipment, says Siemens Ukraine medical equipment department chief Volodymyr Kurylo. It is no wonder that Siemens equipment has been installed at 10 institutes of the Ukrainian Academy of Medical Sciences, 9 regional diagnostics centers, 180 medical institutions of the Health Ministry, and numerous hospitals. Last year alone, Siemens’s share of Ukraine’s medical equipment market increased by UAH 100 million. Meanwhile, with no laws regulating equipment sales, the domestic market of medical equipment is in total chaos, says Mykola Kuzma. The ministry’s attempts to introduce a licensing system for suppliers of medical equipment have proved futile. To put it simply, any business composed of three individuals and headquartered in the basement of an apartment building can sell a computerized tomographic scanner. However, after supplying the equipment this business may vanish without trace, while the hapless owners will have to look for specialists to service this equipment and pay for costly repairs. For example, in 2004 a hospital in Kirovohrad oblast bought a 1993 Siemens AG computerized tomographic scanner. Unfortunately, this model was taken out of production in 1999, while its Health Ministry registration certificate expired in 2000. This did not prevent some enterprising dealers from smuggling it in from abroad, bypassing the head office of Siemens in Ukraine, and selling it at the price of a new unit without a warranty. Experts estimate that illegal imports of medical equipment comprise 10% of the domestic market. At the same time, this market has more than enough unoccupied niches. Domestic producers enjoy the most favorable treatment, of course. Lately, though, priorities have shifted for economic reasons. According to Mykola Kuzma, Ukrainian producers are not always able to compete with their Western peers. Only five or six countries produce high-tech medical equipment. To catch up with them, Ukraine will need significant investments and time to test this equipment, as well as five or six years to gain a commanding lead at least in the domestic market. By this time, however, its equipment will have become obsolete. This means that it makes more sense to buy equipment or parts abroad and assemble it in Ukraine. Several domestic companies have already gained a firm foothold in the Ukrainian market. According to Ukrmed director Mykola Kuzma, this group includes Medaparatura, Yutas, Burevisnyk, MTO Dnipro, and Radmir. Overall, there are up to 100 registered producers of medical equipment in Ukraine. As a rule, there is no one to service their equipment, and they are destabilizing the market situation even further. For example, there have been frequent reports that obsolete equipment is sold in Ukraine at the same price as new equipment, as branches and subsidiaries of major foreign companies are disposing of second-rate equipment. “How is this possible? How could our company, which was established in 1847 and has been working in Ukraine for 152 years, produce low-quality and obsolete equipment for a particular country? First, this would be technologically unfeasible. Second, a company with a widely-advertised brand and reputation would never put them at risk for dubious profit, especially considering that the Ukrainian market accounts for less than one percent of the Siemens markets,” says Siemens Ukraine medical equipment department chief Volodymyr Kurylo. Another hot topic is prices. Foreign-made equipment is sold in Ukraine at prices that are no lower than those in Europe. One reason for this is the flaws in Ukrainian legislation. According to Kurylo, under the Ukrainian Budget Code, equipment bought with budget money on conditions of prepayment must be delivered to the site of installation within thirty days. Meanwhile, linear accelerators that produce photon and electron beams and which are used in cancer radiotherapy, cannot be manufactured and delivered within this deadline, because the technological production cycle for such complex equipment ranges from four to five months from the placement of the order. This applies not only to Siemens, but also to the two other major producers of linear accelerators, Varian (USA) and Elekta (Sweden). The producers have to pay penalties of 0.1% for each day of delay. Ukrainian laws also state that public organizations, i.e., all medical establishments, may pay for equipment upon delivery, provided that budget funds are available at that moment. “We pursue litigation to recover debts from public organizations for several years. But we don’t always manage to collect the money owed to us,” says Kuzma. In addition, doctors’ ignorance raises the cost of foreign-made equipment in the Ukrainian market. Often they have no idea how to operate equipment and sometimes don’t even want to learn. As a result, it is not operated according to the user manual specifications. In a particularly striking case, anesthetic and respiratory equipment was installed at a hospital. After some time the supplier received a call from the hospital staff, who wished to return this “technological wonder,” which, they said, kept beeping and didn’t work. All of this leaves distributors and branches of foreign manufacturers no choice but to factor in all these risks and expenses into the cost of their equipment. Experts believe that the situation in the medical equipment market will improve only when legislators begin paying attention to this essential component of the nation’s health. For example, if a Japanese citizen over the age of thirty undergoes certain kinds of diagnostic examinations every half year, s/he even gets paid for this. The Japanese government did some simple math and came to the conclusion that preventing and diagnosing diseases at an early stage is several times cheaper than treating them over a number of years. 55 countries – 55 years! What steps are needed to pull Ukraine out of the World’s least competitive countries? Are we independent 25 years after the referendum?